RAVENOL GETRIEBEÖL PSA SAE 75W-80 is a high-quality solvent refined base oil based semi-synthetic multi-grade transmission oil with special EP (extreme pressure) properties. RAVENOL GETRIEBEÖL PSA SAE 75W-80 has a special formula for outstanding wear protection and lubrication properties. RAVENOL GETRIEBEÖL PSA SAE 75W-80 is used in manual shift transmissions requiring trouble-free lubrication. 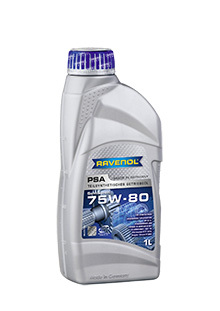 RAVENOL GETRIEBEÖL PSA SAE 75W-80 can be used in manual transmissions where the manufacturer specifies a low-viscosity oil. Low viscosity in low temperatures. Outstanding protection from rust and corrosion.